Move in ready, 3 Bed 1.5 Bath cottage style home, with a 195 sq.ft room addition. In 2018 the kitchen, bathrooms, and room addition were remodeled. Recessed lights, wainscoting, quartz counter tops, new cabinets, windows, vanities, recessed lighting, WiFi Thermostat, Rachio irrigation controller, and many other upgrades. New AC and furnace were installed in 2013. 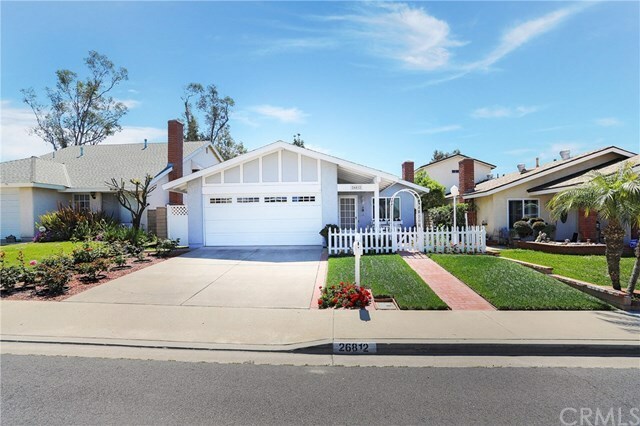 The location is walking distance to a park, shops, and about a mile from Lake Mission Viejo. This home is priced to sell quick, please schedule a showing today. Directions: 5 Fwy, Exit Alicia and go east (towards the Mountains), L @ Via Leon, R @ Via Burriana, R @ Via Linares.